During the months that these positive things were happening for Homestead’s Jewish community, some very different trends were happening in related communities. The so-called “foreigners” in Homestead — that is, the non-Jewish immigrants who came from the same places the Jews did, but largely worked for the mill, were not faring well. Rev. Harsanyi of the Hungarian church spoke out about the large suicide rate in his community, which turned into a long series of newspaper article revealing and debating just how terrible were the conditions of their lives. In the Jewish community outside of Homestead, the Leo Frank trial was coming to a head (he was indicted 5/24/1913 and tried 7/28-8/25/1913, though appeals began immediately and remained in the news), which spurred the creation of the Anti-Defamation league, and in Russia the Mendel Beilis trial (9/25-10/28/1913) was provoking worldwide outrage at how terribly the Jews of Russia were being treated. Looking at the world around them, the Jews of Homestead certainly had reason to feel especially fortunate. 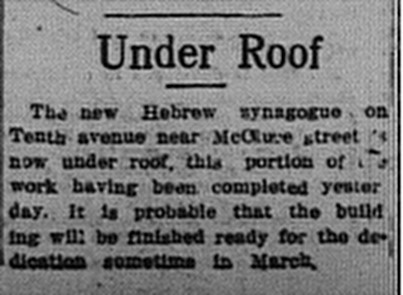 Even though the new synagogue was necessitated an anti-Semitic arson of their previous one, they had the means and the freedom to rebuild bigger and better than before. 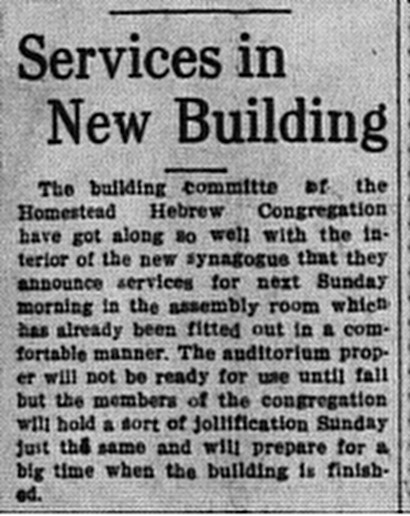 Homestead Will Dedicate Its New Synagogue (9/4/1914): This article, from The Pittsburgh Jewish Criterion, contains the complete program for the day. 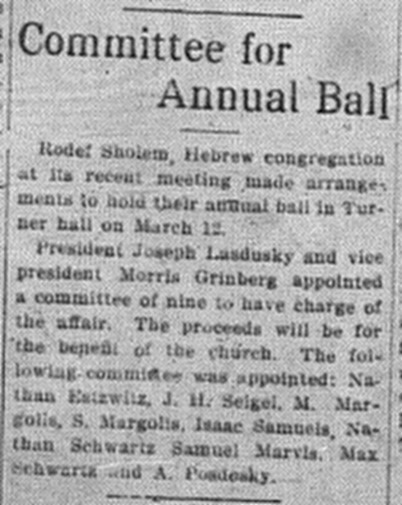 Rodef Sholem, Hebrew congregation at its recent meeting made arrangements to hold their annual ball in Turner hall on March 12. 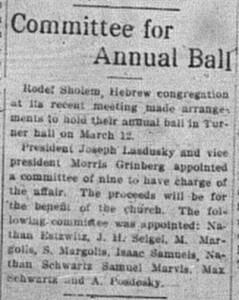 President Joseph Lasdusky and vice president Morris Grinberg appointed a committee of nine to have charge of the affair. The proceeds will be for the benefit of the church. The following committee was appointed: Nathan Esizwitz (sic), J.H. Seigel, M. Margolis, S. Margolis, Isaac Samuels, Nathan Schwartz, Samuel Mervis, Max Schwartz and A. Posdosky (sic). 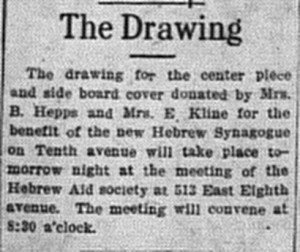 The drawing for the center piece and side board cover donated by Mrs. B. Hepps and Mrs. E. Kline for the benefit of the new Hebrew Synagogue on Tenth avenue will take place tomorrow night at the meeting of the Hebrew Aid society at 513 East Eighth avenue. The meeting will convene at 8:30 a’clock (sic). 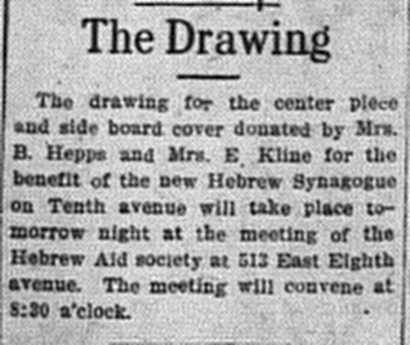 At the meeting of the Ladies Hebrew Aid society last evening a drawing took place for several articles. Ticket No. 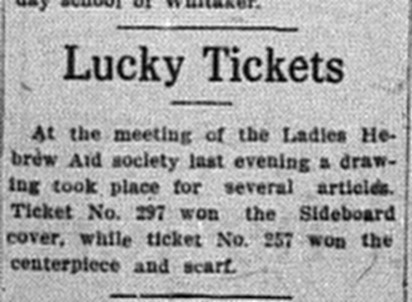 297 won the Sideboard cover, while ticket No. 247 won the centerpiece and scarf. 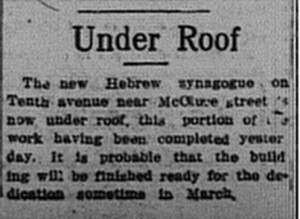 The new Hebrew synagogue on Tenth avenue near McClure street is now under roof, this portion of the work having been completed yesterday. It is probably that the building will be finished ready for the dedication sometime in March. 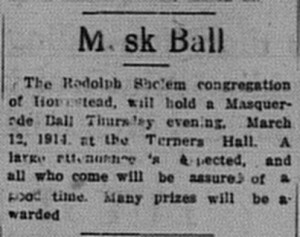 The Rodolph (sic) Sholem congregation of Homestead, will hold a Masquerade Ball Thursday evening, March 12, 1914 at the Turners Hall. A large attendance is expected, and all who come will be assured of a good time. Many prizes will be awarded. 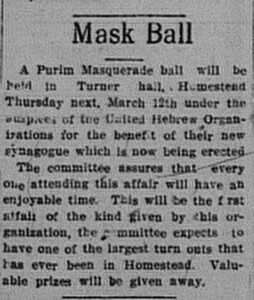 A Purim Masquerade ball will be held in Turner hall, Homestead Thursday next, March 12th under the auspices of the United Hebrew Organizations for the benefit of their new synagogue which is now being erected. The committee assures that every one attending this affair will have an enjoyable time. This will be the first affair of the kind given by this organization, the committee expects to have one of the largest turn outs that has ever been in Homestead. Valuable prizes will be given away. The Purim holiday masque ball held last night in Turner hall on Fifth avenue by the Homestead Hebrew congregation was a very enjoyable affair and largely attended. Besides the Jewish people of Homestead there were many guests from McKeesport, Duquesne, Braddock and Pittsburg. The music for the dance was rendered by the Markowitz orchestra. The costumes were original and unique, many were very handsome and nice prizes were awarded to those the judges deemed the best. One costume received the encomium (sic) of all present by reason of its originality; that of Jacob Lebovitz of McKees Rocks who represented the now famous Russian Jew, Mendal (sic) Beilis tried and acquitted on the charge of ritual murder, in which a protest was made by nearly every civilized nation against his conviction and execution to satisfy the desires of the ignorant and superstitious Russians. Mr Lebovitz’s costume is said to have been a perfect representation of the apparel of the Russian peasant. 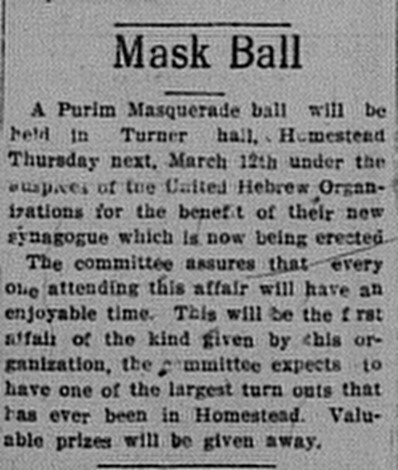 Last night ended the Purim holiday of the Jews which began Wednesday night. It is celebrated on the 14th day of the month Adar. The feast of the Purim is a festival of joy and gladness founded on the story of the book of Esther. Its celebration commemorates the deliverance of the Jews of Persia from total annihilation. 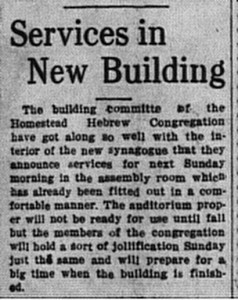 The building committee of the Homestead Hebrew Congregation have got along so well with the interior of the new synagogue that they announce services for next Sunday morning in the assembly room which has already been fitted out in a comfortable manner. The auditorium proper will not be ready for use until fall but the members of the congregation will hold a sort of jollification Sunday just the same and will prepare for a big time when the building is finished. 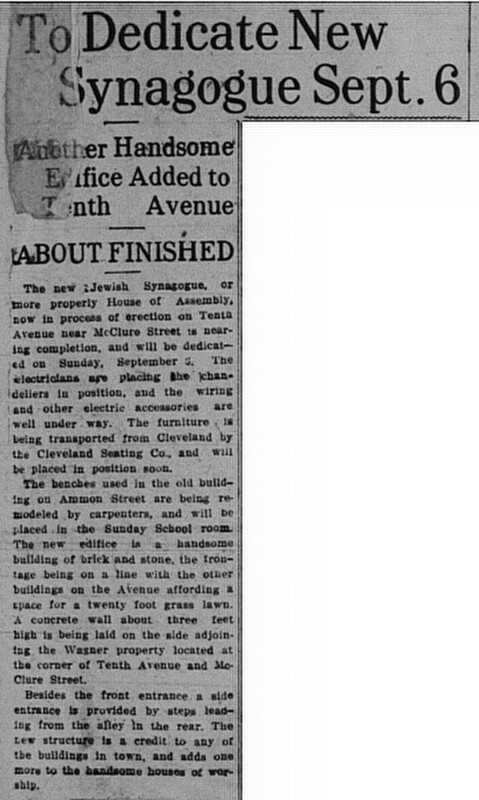 The new Jewish Synagogue, or more properly House of Assembly, now in process of erection on Tenth Avenue near McClure Street is nearing completion, and will be dedicated on Sunday, September 5. The electricians are placing the chandeliers in position, and the wiring and other electric accessories are well under way. The furniture is being transported from Cleveland by the Cleveland Seating Co., and will be placed in position soon. The benches used in the old building on Ammon Street are being remodeled by carpenters, and will be placed in the Sunday School room. The new edifice is a handsome building of brick and stone, the frontage being on a line with the other buildings on the Avenue affording a space for a twenty foot grass lawn. A concrete wall about three feet high is being laid on the side adjoining the Wagner property located at the corner of Tenth Avenue and McClure Street. Besides the front entrance a side entrance is provided by steps leading from the alley in the rear. The new structure is a credit to any of the buildings in town, and adds one more to the handsome houses of worship. 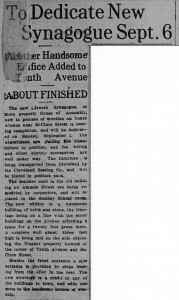 There will be a mass meeting of the Hebrews of Homestead in the New Synagogue on Tenth avenue near McClure street tomorrow afternoon for purpose of completing the arrangements for the dedication of the new building which will take place Sunday September 6. It is proposed to have the dedicatory services of a nature befitting the importance of the occasion and there will be a number of (?) addresses, it is understood, by resident gentile citizens of Homestead and by visiting Hebrews. Dr. M.H. Moss, is chairman of the dedicatory committee and B. Hepps is chairman of the building committee. The officers of the Homestead Hebrew congregation are Joseph Lasdusky, president; Morris Grinberg, vice president; B. Hepps, secretary; Henry Glick, treasurer; Nathan Eskovitz and I. Grossman, trustees. The program for the second synagogue dedication, more elaborate than the first, includes many familiar names from the first synagogue dedication 12 years prior. From the Jewish community, Rabbi Ashinsky, Rev. Levy, Judge Cohen, Attorney Stein, and Honorable Edlis, who have all since grown in stature, make return appearances. 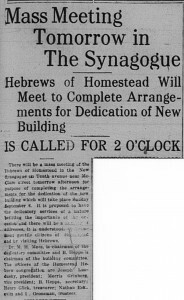 From the non-Jewish community, the current burgess (mayor) of Homestead spoke, as his predecessor did, and so did the superintendent of Homestead’s library. 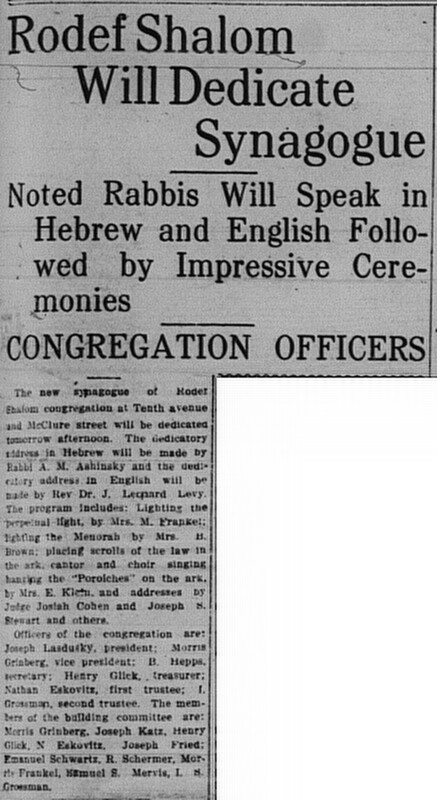 The dedication of the new Synagogue, at Tenth avenue and McClure streets, by the Homestead Hebrew Congregation “Rodef Shalom,” will take place Sunday September the sixth (6th), 1914, at 2 P.M. sharp. 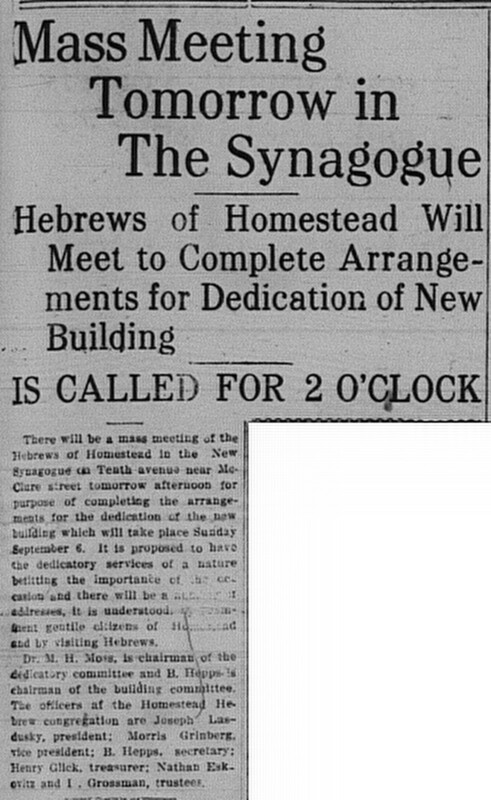 This event will mark a new epoch to the communal life of the Homestead Jewry and will also place to their credit the enrichment of the community of Homestead with a magnificent edifice which is an asset and an honor to the social life of the community. The event will be marked with a splendid program and appropriate ceremonies; well known orators and public officials will participate in making this event impressive and memorable in the history of Homestead. Assisted by the honorary bearers: Messrs. B. Gluck, Jos. Katz and I. Feinberg. For the President and Vice President of the United States. The new synagogue of Rodef Shalom congregation at Tenth avenue and McClure street will be dedicated tomorrow afternoon. The dedicatory address in Hebrew will be made by Rabbi A.M. Ashinsky and the dedicatory address in English will be made by Rev. Dr. J. Leonard Levy. The program includes: Lighting the perpetual light, by Mrs. M. Frankel; lighting the Menorah by Mrs. B. 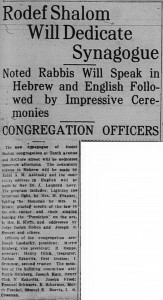 Brown; placing scrolls of the law in the ark, cantor and choir singing hanging the “Poroiches” on the ark, by Mrs. E. Klein, an addresses by Judge Josiah Cohen and Joseph S. Stewart and others. Officers of the congregation are: Joseph Lasdusky, president; Morris Grinberg, vice president; B. Hepps, secretary; Henry Glick, treasurer; Nathan Eskovitz, first trustee; I. Grossman, second trustee. The members of the building committee are: Morris Grinberg, Joseph Katz, Henry Glick, N. Eskovitz, Joseph Fried, Emanuel Schwartz, R. Schermer, Morris Frankel, Samuel S. Mervis, I.S. Grossman.